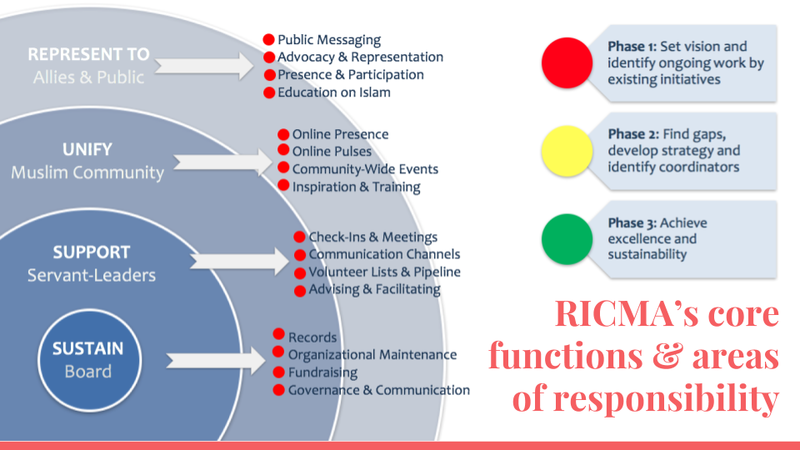 RICMA is a nonprofit organization that aims to advance the Rhode Island Muslim community by facilitating communication across and between the state's many Islamic institutions, organizations, and initiatives; and serving as a point of coordination and contact between the Muslim community and the broader Rhode Island community. Below you'll learn about RICMA's work, core values, and its Board of Directors. Learn about RICMA's history here. The image below represents RICMA's four core functions in relation to four levels of community it tends to. Each function is defined in terms of a set of tasks that RICMA endeavors to either (1) ensure are being addressed by initiatives, organizations, and servant-leaders in the community or (2) address itself.